Yesterday I went for a hike in the Carleton Arboretum, across the Cannon River from St. Olaf College in Northfield, Minnesota. My plan was to meet a group of fellow scholars who were going on a walking seminar with Gordon Marino, the curator of the Kierkegaard Library here at the college. 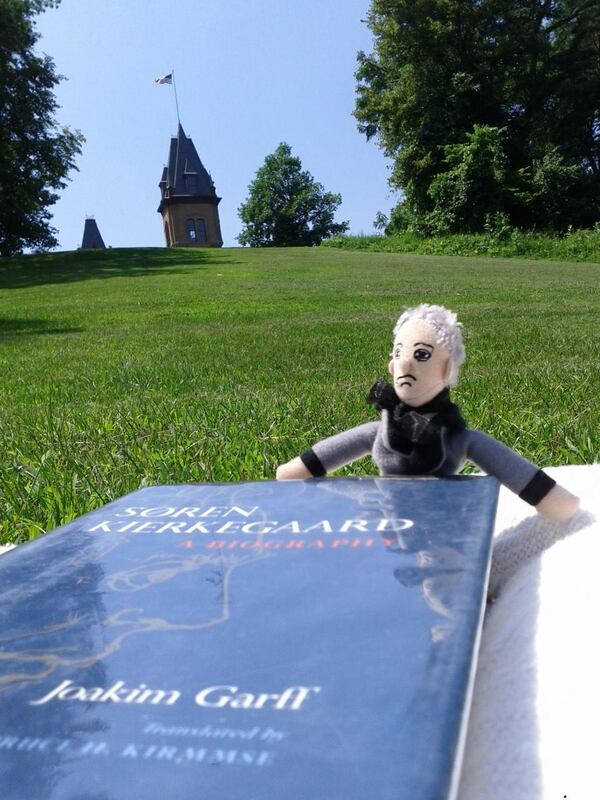 He warned us that we would only be allowed to talk about Kierkegaard, though we assumed he was kidding. I do not know if we were right because I was waylaid by a train on my walk to the arboretum, and the group had already left by the time I arrived. Resolved to enjoy a hike anyway, at first I kept a brisk pace, hoping to catch up to the others. Eventually the trail split and I faced a choice. I realized that whichever path I took it would be silly to continue rushing along after the group when it was just as likely that I was chasing no one as it was that I would catch up to someone. I came to the woods to slow down after a week of intense study, to look at the world around me, to give my mind space to wander, not to walk so fast I didn’t even notice the place I walked. I chose the right fork, and enjoyed a peaceful, solo hike. Reflecting on it now, the whole situation resonates with my scholarly life. I am often chasing someone or something, some illusive idea just out of reach, some career course that must be plotted ever so carefully if I am to earn the approving nods of my peers. That split in the path? I have to choose, and there’s supposed to be a right choice and a wrong one. But what if there’s not? What if, to paraphrase Kierkegaard, it’s a case where whether you do it or do not do it, you will regret it either way? This would be an accurate description of my how I’ve often thought about the possibility of a PhD over the years. I made the choice to follow the fork in the road that led away from philosophy and toward writing. I am happy with my choice, yet I mourn what I’ve chosen not to do. I think, now, that this too is inaccurate. My life is less like that path with a fork in it and more like a labyrinth where I put one foot in front of the other and find myself right where I need to be, though I will not pretend I am always capable of seeing it that way initially. Life is lived forwards, but understood backwards, as Kierkegaard wrote. Looking backwards now what I see is that there was never a wrong choice; rather than “you will regret it either way,” I wish someone had told me that you can be content either way. Here in the wonderland of Northfield, MN, where I can smell the sugary sweetness of the Malt-O-Meal factory on the wind as I walk up the hill from Porter House to the library, here in this place where my sole responsibility is to read, write, and think about my favorite philosopher and writer, I find myself chasing again, trying to catch up to those who followed a different fork on a different road. It’s not too late. I could still do it, you know -- choose a PhD in philosophy or theology, instead of the strange amalgam that is my life as an essayist. But it is philosophy that made me an essayist in the first place. I have been writing since I first learned to shape letters and words as a child, but it was in my philosophy courses that I learned to think on paper, to wonder about the world, to eschew the easy answers. Phillip Lopate says it best in To Show and To Tell: "For me, the great adventure in reading nonfiction is to follow, as I say, a really interesting, unpredictable mind struggling to entangle and disentangle itself in a thorny problem, or even a frivolous problem that is made complex through engagement with a sophisticated mind." As I study Kierkegaard’s authorship, in particular considering what he claims about his “point of view” as an author, and bits and pieces I am learning about his life through Joakim Garff’s massive biography of the great Dane, I’m struck by how much these lines from my newest muse, Lopate, resonate with my long standing interest in Kierkegaard. He’s mischievous, with his pseudonyms and their stories. Whether under his own name or another, he never gives a flat answer. He invites me to wonder and wander, in his mind as well as in the jungle of my own ideas and questions. In his work I become entangled and subsequently disentangled. What is the essay, after all, but an attempt? Not thesis driven, but exploratory. And so, I journey through Kierkegaard’s pseudonymous writings and get well and truly lost, and then I sift through the theoretically more straightforward upbuilding discourses, and try to put them together, to play them off each other to reveal some hidden insight. I seldom reach a clear conclusion, but in the end I am always somewhere different than where I started. For me, to be an essayist is to be a philosopher; to be a philosopher is to try.